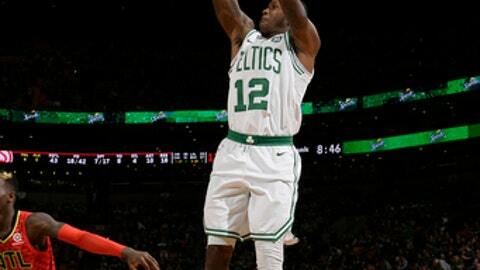 BOSTON (AP) Terry Rozier’s second act as an NBA starter was just as impressive as his first. Rozier started in place of the injured Kyrie Irving. The third-year guard became the second player in league history with a triple-double in his first start, totaling 17 points, 11 rebounds and 10 assists in Wednesday’s blowout of the Knicks. Irving missed his second straight game with a right quad contusion that he suffered in Monday’s win at Denver and was one of four Boston players who sat with injuries on Friday. Rozier will soon have to yield his starting backcourt spot to Irving – and he’s fine with that. Taruean Prince had a career-high 31 points and eight rebounds to lead the Hawks, who have lost five of six. Dennis Schroder added 25 points and Marco Belinelli had 15. Schroder’s jumper with 7:19 left brought the Hawks within 10 at 103-93, but Atlanta wouldn’t come any closer until the final minute with the game out of reach. ”It speaks a lot (about) the guys here,” Horford said. Prince was named as an injury replacement for Milwaukee’s Malcolm Brogdon in the Rising Stars game during All-Star Weekend. Prince will join Hawks rookie forward John Collins on the U.S. team roster. The Celtics have not announced their reported signing of recently bought-out C Greg Monroe, but that didn’t stop Morris from weighing in on the potential addition. Hawks: Schroder played after being listed as questionable with a right shoulder strain. … F DeAndre’ Bembry (left adductor strain) missed his 20th straight game. Celtics: All five Boston starters scored in double figures for the first time Dec. 23. … Coach Brad Stevens said Irving is feeling ”a little bit better” and is considered day-to-day. … Morris said he will be questionable to play Sunday. … Smart will likely miss an additional 10 to 14 days, Stevens said.